100 word drabbles inspired by/based on David Bowie songs. Contribute your own, if you'd like! All fandoms welcome. A Familiar Place - After the war, Hermione decides to go back to Hogwarts to continue her education. On the train there she finds Draco Malfoy. He's on the way back to Hogwarts as well, but the only reason he's going back is because he has no where else to go. This unlikely pair will forge a bond that will take them from 'A Familiar Place' to places that will challenge them as no other places has challenged them before... but at least now they will have each other. A Familiar Place II (A Founders' Story) - Two years later, Hermione and Draco return to Hogwarts, but this time as Professors. However, nothing ever goes smoothly for this young pair of lovers. While planning their wedding, they are drawn into a mystery surrounding the founders of Hogwarts, an excavation site, and a secret society called The Brotherhood of the Raven. A Familiar Place III (A Future Untold) - Now married and with their first child on the way, Hermione and Draco believe they have finally left the scars of the past behind them. Suddenly, Draco finds he must go to the past, to relive the worst year of his life, to save the future that he holds so dear. Will he come out of it alive? Will he change the future, or will it be up to Hermione to save them both? A Familiar Place Christmas - A short story where a slightly depressed Hermione goes looking for the true meaning of Christmas, never once thinking to look in 'a familiar place'. A series of Christmas stories featuring Hermione Granger and a host of others! Includes challenges, one shots, and multi-chaptered stories. All characters belong to JK Rowling and Warner Brothers and I make no money from the writing or publishing of these or any other stories on this site. These stories follows Hermione Granger and Draco Malfoy through four different, but crucial weeks in their life together. In week one, (A Week in the Life) they reconnect after many years of being merely acquaintances. Can one week make a real difference in their lives? Is it enough time to fall in love? For Hermione Granger that first week was the most important week of her life. She went from feeling sad and small, and viewing her whole world as grey, to falling in love. The second week, (Another Week in the Life) occurs months later, and follows the pair as they plan their wedding. While Draco is happy and willing to plan the entire thing, Hermione is reluctant and guarded. Why does she have a funny feeling that there is another reason why he wants to marry her, besides being in love. Week three (A Third Week in the Life) is the most important week of all. Taking place many months later, she finds she is with child. Is this happy news, or is there 9 months of pain and agony awaiting them. They'll have to live through it to find out. The fourth week (A Fourth and a Final Week in the Life) is the final week in the series. Each chapter covers one day, in one month, of one year, starting with the first year their daughter is in school, and ending the year their daughter marries. The ups and downs of their journey of life in this last installment will test not only Draco and Hermione's love, but the strength of their marriage. The characters and canon situations in the following story belong solely to JK Rowling. I am not making any money from the publishing or writing of this story. All characters and canon situations belong to JKRowling and Warner Brothers and I make no money from the writing and publishing of this story. All characters and canon situations belong to JK Rowling and I make no money from the writing or publishing of this story. Thanks! I give you Lucius Malfoy and Hermione Granger, the bachelor and bachelorette of the Wizarding world. PWP. Summary: Daryl and Michonne's story arc in four installments. A small collection of short stories and drabbles all about love & hearts... on in other words, about Valentine's Day. A series of seven unconnected stories about seven Death Eaters, each one representing a Seven Deadly Sin. Part 1 – Wrath – Regulus Black turned his back on the world because his anger and hate began to consume his soul. Could a woman, showing ultimate patience and kindness, show him how to turn his wrath and anger into love? Part 2 – Envy – Severus Snape spent his entire life envious of things he could never have. Then one day, he experienced a ‘new memory’, which showed him that he could finally want something more. Part 3 – Sloth – It seems Scabior’s a bit obsessed with her, and it’s all her fault, so why should he do anything about it? Part 4 – Gluttony – If Greyback wanted something, he took it. If he had a hunger, he filled it. Over-indulgence and over-consumption were nothing to a werewolf. Therefore, when he saw her, he wanted her. End of story. Part 5 – Greed – Nobody knew more about greed than Lucius Malfoy. Nobody. Part 6 – Lust – Draco Malfoy had always lusted after Hermione Granger. He didn’t care if she was in love with another man, because this wasn’t about love. It was about something more primitive than love, and besides, Draco Malfoy always got what he wanted, even if he had to lie, cheat and steal to get it. Part 7 – Pride – The most deadly sin of all… it’s often said that pride goes before a fall, and since pride is considered the most deadly of all sins, who else should star in a story about the most proud Death Eater of all but that Death Eater himself? Tom Riddle. Two stories that show how Snape might have fared after the war. Stories written using the Regency Era as their theme... Thank You, Jane Austen. All characters belong to JKRowling and Warner Brothers and I make no money from the writing or publishing of these stories. Stories written exclusively for 'The Maple Bookshelf' Challenges and 'Carrots'. All characters belong to JK Rowlings and Warner Brothers and I make no money from the writing or publishing of this story. 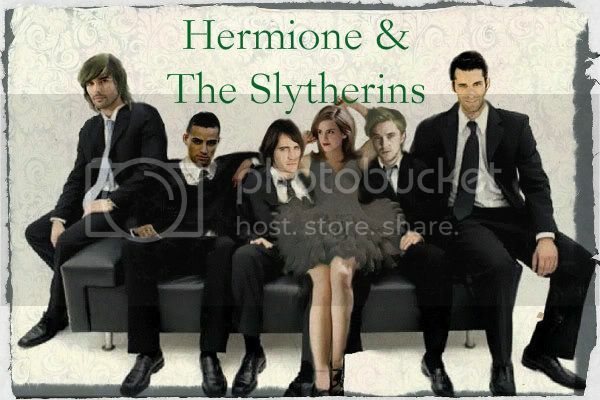 What I envisioned happened to the Slytherins after the war. This series was written before Ms Rowling made her revelations about the characters, and as such, is AU. A short story for each month of the year, featuring Hermione Granger and a special man each month. Translations of some of my stories... thanks to those who took the time and effort to translate my stories! I appreciate it!